Heat oven to 350°F. Spray 2 cookie sheets with cooking spray. Unroll breadstick dough on work surface. Cut dough in half crosswise, and separate to make 16 strips; cut each of the strips in half lengthwise to make 32 thin strips. Place strips on cookie sheets, 1 inch apart. Using a small paring knife or kitchen scissors, make 4 thin cuts (2 inches long) on 1 end of each strip. Spread out cut ends to make bristles of each broom. Brush dough with oil; sprinkle with Parmesan cheese. Bake 10 to 12 minutes or until golden brown. 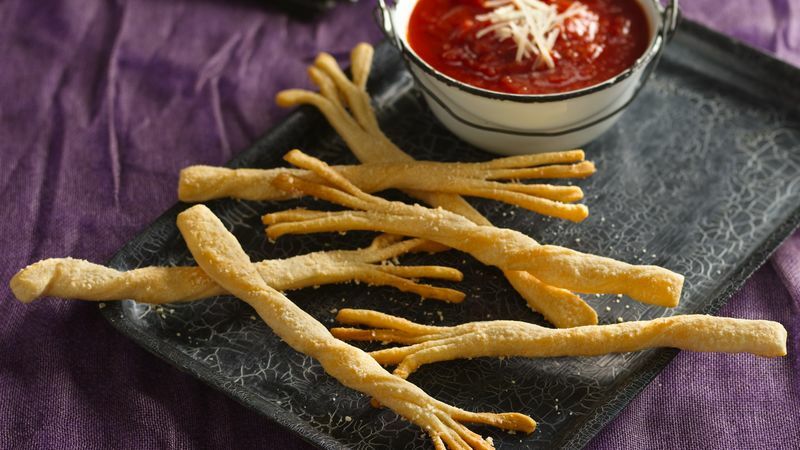 Serve with marinara sauce. Serve these brooms with Toad's Eye Soup. For the recipe, visit pillsbury.com. For easy cleanup, cover the cookie sheet with cooking parchment paper.